. . . 1 9 9 7 . . .
WoW! Club Soda in Montreal; Enmore in Sydney; Fillmore in San Francisco; Tivoli in Utrecht; Strawberry Tree in Killarney; Park West in Chicago.......! Such sweet memories you great people bring to me. You remind me what a lucky man I am; to bring my songs to different towns and enjoy such good times. I remember every show referred to on the List and through your reactions am transported to a lovely place in my memory. For example, the Fillmore West show was the first night of a 6 week tour with the Pogues. It was a frightening experience at first, a true baptism of fire. But the Pogues are great people and it was a magical mystery tour. Being onstage at the Fillmore I felt very aware of the musical history of that venue. Certain rooms have an almost tangible taste of previous performances. The Fillmore is rich in this history and I was honoured to grace the stage. Let's do it again! This is my first time to contact the List, and it feels a little odd. I really just want to express my gratitude to all the people who have created this Cafe; especially Jan (Whalen), who I believe led the charge. I have no direct involvement in this, which is as it should be. I simply find myself in an internet cafe in Dublin with a need to log on and say thank You all. Please forgive me if I don't get involved in the chord analysis that's happening currently. I don't even know what I'm doing! Whenever people Quiz me about chords, I always try to encourage them to discover their own voice, whatever the instrument. Good luck! The new cd is finally cooked, and will be served in the not too distant future. In the meantime I wish for all of you Happy spring days full of great songs and music. Except of course you Australians who are getting out the woolie undies. What a World. Put on the kettle Nainsi, I'd love a cup of tea; milk, no sugar. It's been a while since I visited ye all. How's it goin'? It's a beautiful thing to witness the evolution of your club/fellowship whatever it is. Some tres groovy photos appearing. Also dig the Irish classes; ye're putting me to shame. I still can't get the hang of this means of communication, so God only knows how this will appear on the various computers. Please bear with me. I love the process of connecting the songs with a visual collection of images. One of the most satisfying aspects of working with Warners in L.A. was their Art department. The art work on the 3 cds is something I'm very happy about. Generally, I'd rather have fewer mugshots and more interesting visuals, but one has to accept the fact that the artist is generally what people want to see on cd covers, Yes, no? Turf is as close to a Live album as will happen in the foreseeable future. There will be video(s) with the new cd, which, by the way, will be released by Christmas. The Choir in question is the audience at Tivoli, in Utrecht, Holland. Maighread ni Mhaonaigh of Altan sings Sunny Sailor Boy with me. I sang and played on his Iron behind the velvet cd about 2,ooo years ago. Don't do clothes questions, sorry. The fact that people are interested in my lyrics and guitar-stuff amazes me. The fact that you take so much trouble to decipher what I'm doing is a huge complement. I have no clue what I'm doing. If I've given any sense that I don't approve, I apologise. At worst I'm a little embarrassed, but thank you for the enthusiasm. Speaking of lyrics; the word in Gone to Pablo is 'galleries'. From time to time I encounter a Life which moves me in such a way that I literally have to write a song, because I'm so affected by the person. My father (man is alive); my mother (Sanctuary); Paul Hill (This is for life); Joni Mitchell (To begin to); Jaqueline Rogue (Gone to Pablo).............. Peoples experiences, and struggles in life are often the canvas on which I seek to paint my own Songdreams. There is no gameplan, only a desire to seek and express the beauty, and the truth in those around me; whether they be family, friend, or a distant life that touches momentarily. I'd love them all to be re-released. They're all part of the ongoing work-in-progress!! I only find people intrusive when they exhale booze in my face at close range. The magic word is respect, and most people have it in abundance, thank God. Being Andy Moore's brother is the business, because I love that man. Speaking of brothers, where's Kevin gone? Did ye scare him off? Pity really, he seemed like a good guy having a laugh. I can't wait for the next cd to come out so I can go to Oz, NZ, NYC, LA, SF, DC, Berlin, Hamburg, Amsterdam, Lausanne, Leuven, Manchester, Glasgow, Montreal, Galway, maybe even TULSA!!!! One small request to those of you reporting the shows (if I may). If you quote everything I say between songs, you're depriving one of your cyber-pals the experience of hearing something firsthand. And somethings have to be repeated, because they're just right. Just a thought. I'll keep ye posted on the cd. It's so great that some of you are meeting each other. Thanks for letting me in from time to time. I have always believed that a song is not complete until the listener brings their life's experience to that song. Your generous responses to these songs bears out this sense. It is beautiful to see the ripples that flow out from my humble beginnings. Thank you. On another little matter, I personally find this Virtual Luka stuff a little spooky. It's as though I'm reading about a person who doesn't exist! I know it's none of my business, and I know it's well intended, but to be honest the thing I've enjoyed about this List is the sense that this is something Real, as opposed to Virtual. Jesus, I better shut up, or I'll never get a gig in Tulsa! May I thank you all for being so patient regarding the new cd. This year has helped me get to grips with the P word, bigtime. The cd is done, the ink is wet on the deal; please God the release will come with the daffodils, and the movie will get to a cinema near you! Many of the songs referred to from gigs this year are not on the cd, because they were written after the event. The good news is that the wait for the next cds will be much shorter, due to the current supply of huge hits waiting to be unleashed on the unexpectant masses! This year I realised a dream by producing my first cd for another artist. My nephew Conor Byrne has grown into a remarkable flute player and composer of music. His debut emerges in Feb. '98. Many lovely moments on stage this year; the highlight being in The Hague in September, when Michael Franti [Spearhead], and Marie from Zapmama joined me for The Fertile Rock and I need Love. Precious moment. Sinead's EP was great. The Blue Nile were amazing in the Olympia [Dublin]. Hey it's Christmas and people are humming 'Such a perfect day'. I'm avoiding the rush and crush of Christmas, and telling my folks how much I love them. That's my present, this year. The scale of this Page, and associate Pages, amazes and humbles me. Many thanks to all concerned. I can't wait to sing for you all in person when the shows begin. In the meantime stay warm, [cool in Oz], be well, have a delicious Christmas, and may 1998 bring you all the Love you need.
. . . 1 9 9 9 . . . I just read the (LukaList) Archive for the first time in ages, and realised I'm long overdue a visit to the site. It's quite a remarkable year for me to reflect upon. At the beginning of 1999 I parted ways with my manager; and my record deal with SONY fell asunder. Yet at the end of the year I reflect upon many great nights; more shows than I've done in ages. 3 visits to America, shows in Ireland; and of course, the marathon run around Europe. That was incredible. It's so good to hear people talking about shows, instead of people wondering if the shows would ever happen. This has been a very empowering year; during which I have learned that simplicity is the key to progress. I have also learned that creativity is the only meaningful driving force in this working life. The songs, the music, the records, the shows. These are the meat and potatoes of my working life. And anything associated with celebrity is a distraction; and mostly of no value. I have also learned AGAIN, that I am an incredibly fortunate person; to be given the oppurtunity to sing my songs for people is really a miracle. This year I really appreciated this simple fact. It is tempting to isolate certain moments of the year, and claim them as highlights; but in truth what I want to celebrate at this moment, is the year's work. Every show had magic for me. Though I am sorry I neglected to post the Swiss shows on the list; only because the Berne show was on top of a snow-covered mountain, in a new club. 400 people came to the gig by cable-car!!!! Then there was the Lifeboat show on Inishmore; the Buddhist centre in West Cork...... but I will make reference to the Union Chapel show in London; a working church, with a BAR. This gig took place the night the British transferred power for Northern Ireland to Stormont, and the peace process began to bear real fruit. Forgiveness was very special that night. Some of your speculation on the new record is pretty perceptive. I'm recording in January; mixing in February. One of you is right about the title. The record will appear gradually throughout 2000 on various independent labels. I'll keep you posted. Though I'm gigging in America in March, the record won't be ready then. May 1st I return to AUSTRALiA, YIPEE!!. Actually Paul, my sound man and I are acting as the advance party for the Irish surfing team for the 2000 Olympics. Hopefully the rest of the year will be busy with shows, because it's so much fun. Finally, and most importantly; thank you one and all for all your encouragement, support, thoughts and prayers. I hope 2000 brings each of you all the peace, love and joy you deserve.
. . . 2 0 0 0 . . . I hope you have all settled into the new year. I've decided to forget about the millenium; although I wonder how I'll celebrate the next one? A gig on Mars, perhaps? I'm contacting the list for a reason. It has come to my attention that some of you have been speculating as to what songs by other artists I might interpret in the future. With this in mind, I'd like to invite you to suggest to me; songs which you would like me to interpret; or at least to try! The songs can be from any area of music; from ABBA to Nirvana; from John McCormack to Johnny Rotten. Just list the titles; the artist/band; and a cd where I can get the song. Once they appear on the Archive, I can go to work, and we'll see what happens!!!! Also, some of you have been asking what is Christy saying on I'm a Bogman. The answer is; I haven't a clue. I think Christy goes into a secret bog-code sometimes, and I've never been able to crack it. Sounds good though. Greetings, and a very happy new year to my music friends in Cyberia. So, what do birds do when time flies? And don't it just fly. 2000 has been a really remarkable year. I must begin on a sad note and express my sorrow at the loss of such a sweet star as Kirsty McColl. Her loss is huge, and too tragic for words. I never met Kirsty but loved her voice, still do, and always will. I can only pray for her family, and send them good wishes in an impossible Christmas. RIP. Again, I want to thank from the bottom of my heart, all the people who take enough interest in my work to come to shows, to own cds, to comment on songs, and thus be part of this musical journey. It is ever apparent to me that I have great fortune, to sing and write songs. I hope whatever twists and turns that life presents; that I never lose gratitude for the many blessings constantly bestowed upon me. I love to have this opportunity to say thanks to some of you; my only regret is that I can't directly connect with those who are not 'online'. Somehow I hope they too are aware of my gratitude. However the real value of this cd, is the opportunity it has given me to enjoy the greatness of other artists; and the good response to the cd gives me great hope for my future independent projects. I've already begun to work on the next cd, but it will take time, and I don't expect it to be available before Jan. 2002. As some of you know, I'll be performing a lot in 2001, yipee! Regarding this LIVE cd, I need to clarify the situation. Over the past years I've recorded a good few shows, and will continue to do so. When we booked the Kleine Komedie for the coming Dutch tour, I remarked to the Manager (of the theatre) that it would be a nice room to record in. I NEVER intended them to advertise a Live recording for the shows. I would never do that; as this would affect the atmosphere. The whole charm of the live show show is the spontaneous, the unexpected. I probably will record the Kleine Komedie; but I never intended it to be perceived as THE definitive show for a cd. I sincerely apologise to all of you who are practising your whistles, cheers, singalongs, heckles, in the hope that you will recognise yourself on my live cd! There will be many shows, and I have no idea which ones will give me the songs for a future live cd. I'm reluctant to do a live cd because the show is a bit sacred to me; it's an in-the-moment experience. But I'm always asked for one; and my resolve is weakening. Any way, I apologise for any misunderstanding; I'm sure it's all my fault. 2000, again brings me many sweet memories of shows. The Century Ballroom in Seattle was lovely; the Irish festival in San Francisco really surprised me; I just didn't expect to do so well. Irving Plaza, in NYC; everywhere in Australia; Dingle; Caherciveen; Montreux Jazz Festival (WOW); Ancienne Belgique in Brussels; Roeselaar?, the last show in Belgium..... So many memories of lovely people sharing sweet moments with me. This year I am going to do something I never do, and single out one show for a special mention. It's the Markthalle in Hamburg. Can't explain it; but from the moment I walked on stage I was in the white light. It was effortless and dreamlike; and the response of the people was embarrassing, so lovely. All shows are special, and I really try to make it that way. I never treat one city as more important than the other. You never know when this special feeling happens; so you look for it every time. It's a reward. This night in Hamburg, the sound was perfect, thanks Paul; the flowers were right; the lighting was fine. I was happy, and the people were sublime. Thank you; and thank you to all the people who come to these evenings. I am sharing this special moment with you, not to suggest that this was a 'better' show than anywhere else; only to share a special moment with you. It also confirmed something I have felt for a long time; that Germany is a country full of gentle, sensitive, kind people. Finally, I am beginning to find an audience there; slowly but surely; and I'm really happy about that . Next year I'll be singing in Ireland, England, Scotland, Holland, Germany, Scandinavia, Switzerland, Australia, the US (I hope! ); and anywhere else that will have me!............ I am truly blown away by the kindness of people. Everywhere I go, people bring flowers, books, even bicycle tools!, to share with me. You never need to do it, but I thank you all. I end this year in gratitude; and with the anticipation of soundchecks, preparations, dressing rooms, flowers, and hopefully many nights of song in the coming year. I wish for you, all the blessings of the world for your new year. Take care, have big fun.
. . . 2 0 0 1 . . . Ever since I recorded LL Cool J's 'I Need Love', fans have been asking for an album of covers. I had never really been drawn to the idea until last year. To mark the new millennium, I decided to go back to "song school", as it were, and study the work of artists and writers I admired. Rather than simply create a collection of my own favorite songs, I wanted to investigate worlds other than my own. It's been quite a little adventure -- trying to find great songs in different styles, trying to learn them, and trying to bring something of myself to the songs. 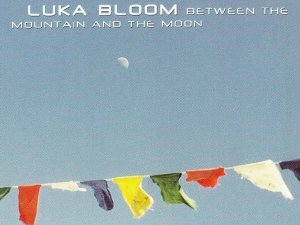 After all, I had to end up with a Luka Bloom record. 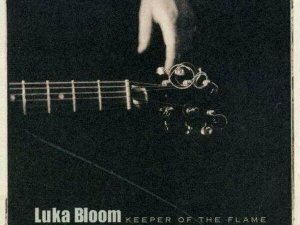 I had already been playing 'Keeper of the Flame' which I knew from Nina Simone's recording and I had learned Bob Marley's 'Natural Mystic'. But as a performer the rest of the songs on this disc were all new to me. I was pleasantly surprised at how easily I connected with Cure songs, Radiohead songs� On the other hand, I was disappointed I couldn't seem to find a Van Morrison song that suited me. In making this CD, I have once more found new areas to explore, and it made me realize yet again that the only barriers in music exist in our minds. I truly never imagined I would one day record an ABBA song; now I love to perform it. I look forward to singing these songs for you in America this August. Busy and interesting times. I decided it's time to declare some of my current intentions. First, a new website. 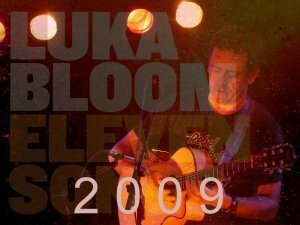 Thanks to the efforts of Dan Keenan, the lukabloom.com domain is being transferred to me. A multimedia company in Dublin called Pointblank, run by friends of mine, are creating a new site for me. This site will have a very specific purpose. Because of the wonderful contributions by all the people associated with YOUR various sites, I've decided that this new site would be fairly minimal in the information department; but would link to the various interconnected sites. 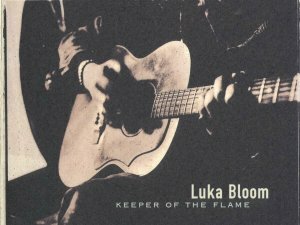 The main purpose of www.lukabloom.com is to present and sell, my cds. As you now know, I am no longer contracted to a record company. I will continue to license cds to various labels who I want to work with; but now I also want to see if there is a market for my work on the internet. The site should be active by the beginning of August. I'm launching the site with a special project. The first cd which will be available is a cd I'm calling 'The Barry Moore Years'. It's a compilation of songs I wrote between 1975-1986, some of which featured on Treaty Stone, In Groningen, etc... This cd will ONLY be available through the site, and at my shows. There will be no campaign, promotion. It's a historical record of early work, mastered for cd; and I hope people will like it. If the site is in anyway successful, I will use it as much as possible to introduce and offer new works to people. It's all new to me folks; we'll see how it goes. Hopefully it won't be long before you can see for yourselves. There will also be news of a new cd of my songs before the end of the year..... I loved the Keeper of the flame project; but you've gotta move on, and as we say in Ireland, it's all go! Have a lovely Summer; or stay cool down under. I have decided to offer the song 'Colourblind' on my website, as a mark of sympathy and support to the people of Washington and New York; and as a tribute to the great people worldwide, whose love and courage sustains us. The collective spirit of New York is a unique phenomenon in the world. I have been privileged to experience that spirit. This is the least I can do. It was filmed last week in a garden in Dublin. The Anti Racism gig at The Point was wonderful. a great night's music, for a very important cause; brilliantly organised. The audience was fantastic, and on a personal note, I got to sing with Sinead. Moments like this are dreamt of. Thanks and well done to all involved. At this moment, I send out my sympathy to the family of Mic Christopher, a wonderful Irish singer and songwriter who passed from us way too soon, the same day as George Harrison. We also lost Noel Brazil, another Irish singer and songwriter, the same day. Sorrow and sadness; but we know the songs live forever. Rest In Peace. Just so you know; 'Between The Mountain and The Moon' will be released on Jan 22 in the US; and Feb 1st in Ireland. All through 2002, I'll be singing round the house. Possibly two Swiss shows after Germany. Then Australia; Ireland in May; possibly US in June; European festivals in Summer; and a big European tour next autumn. I'm packing the toothbrush, and the rescue remedy! By the way, watch out for the band opening for me in Brussels and Amsterdam. They're called HEM, and are really wonderful. This has been a great year of change and preparation. Changing the way I present my work, and preparing to sing again. Thank you to Brian Masterson, all at Windmill, and all the great people who helped make 'Between The Mountain and The Moon' such a special recording in my life. Thank you Paul Scully for being such a great sound engineer, and such great company on the road. Thank you ASGARD for sending me round the house singing. Thank you COG, SKIP, BARNONE, MUNICH, SHOCK, and Warners Switzerland, for licensing this cd in your territories. Thank you all the people involved in the gigs I sing at. Thank you all the people who sent me copies of old records, and helped create 'The Barry Moore Years'. Thank you Usna, Turlough, Colm and David for setting up this website. Thank you Anne for shipping the cds. Thank you Kieran and Briege for minding the fort. Thank you all the people involved in other websites connected to this one. Most of all, to everybody who buys a cd, comes to a gig, emails the site. It honestly blows my mind that people care enough to do these things. THANK YOU so much. This has been a mad year. I won't comment on the global madness, except to say that it will make me sing more, laugh more, and love more. It's all I can do. God bless you all, Peaceful Christmas, and I expect everbody in Carre on Feb 11 to sing the whoayeayewhoayeeaye bit in 'Rainbow Day'! Favourite movie this year - 'Amelie'. Favourite CD this year - '10 songs', by Leonard Cohen (some lads improve with age!). Favourite gig of mine - Olympia, Dublin. Favourite other gig - Spearhead, HQ Dublin; or Christy, Donal and Declan at Vicar St. Dublin. Favourite gig next year? - Them All.
. . . 2 0 0 2 . . .
Greetings and apologies for the delay in communicating with my friends in Cyberia. Last year was wild and wonderful and after the 39 European shows I needed a bit of time to forget all things Bloom! I hope you all had a lovely Christmas, and lf you don't celebrate Christmas, I hope you're having a good break, staying close to the ground, waiting for the light to shine. May 2003 bring you all closer to your dreams, and if not, please keep dreaming. l'm 47 now, and things are only starting; so hang in there! There are so many wonderful little moments to recall in 2002; many gigs in many cities in Europe, the US, and Australia. Too many to list, but I will share one little gem with you all. Last March, I played at my first Australian festival, in the delicious Byron Bay. This is a special place in the world, and a festival not to be missed. Anyway, as usual, I was in my dressing room, awaiting the moment of singing. This is always a very precious moment in the working day, waiting to sing. l was summoned to the stage, and I left my dressing room. As I walked toward the festival marquee, I saw before me about 12 monks dressed in beautiful red robes, walking up the steps of the same stage I was about to sing on. I immediately realised what was happening, and was overcome with a huge emotion. These men, between the ages of 30 and 80, were the Gyuto monks from Tibet; a group of heroes who travel the world singing, and keeping the story of Tibet alive in story, prayer and song. They must have seen the prayer flags on the cover of my last cd, and were walking to the side of the stage in Byron Bay, to hear my songs. You can't plan moments like these in life. l just keep singing my little songs, and every now and then, something magical happens, which reminds me of the beauty of this fragile world, and the gorgeous people who live here. I cannot describe the energy I felt throughout that performance - I only know that these beautiful men blessed me with their presence on the stage and I will never forget their smiling faces and their warmth when I bowed to them at the end of each song. Standing in this field in Byron Bay after the show, we spoke through an interpreter. We spoke briefly about Tibet and lreland, and how songs bring people together. The glow of this encounter lingers with me, and will hopefully inspire the work in 2003. I extend my thanks to the Gyuto monks for coming into my world that day in Australia and I also thank all the people who came to hear my songs last year. God bless you all. I must also thank all the people who have worked with me this past year and helped the songs reach you. Especially Paul Scully and Niall Rynne, who travelled with me, and put up with me, throughout the year. My agent, Paul Charles, who books my shows, and all his comrades at Asgard. Paddy Doherty. MCD. Mojo in Holland, Karsten Jahnke in Germany, Pascal in Belgium, Alon Renner in Switzerland, Adrian Bohm in Australia. Brian Masterson and all at Windmill where we mixed the cd you'll be hearing in April!!!!!! (more on this later). And of course, all the people who work to make this website the place it is. Thank you Turlough, Usna, Anne Rynne, Colm Lyons. Also thank you to those who simply volunteer to contribute their talents, time, and love in amazing ways. Unfair as it may seem to single out someone, I have to say a special thank you to Rena Bergholz. And anybody I've neglected to mention, a Special Thank You. This is going to be a very exciting year, and I look forward to writing lots of songs and singing them for as many people as possible. lt is also a very dangerous year, with the possibility of a mad war looming. I pray and sing for peace, and wish you all well in your travels this year.
. . . 2 0 0 3 . . . 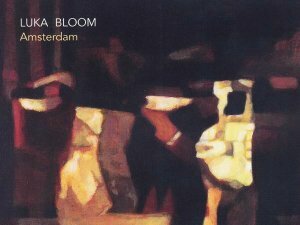 It's been a great time, since the release of 'Amsterdam' last April, during which my first gig in Melkweg in Amsterdam was a great night. The US tour was wonderful in May. I loved every gig; but the highlight for me happened in the first night in Chicago. A wonderful teacher named Jen, presented me with a book of letters and drawings from her class, in gratitude for my song 'I am not at War with Anyone'. I sometimes forget the power of songs, and this moment was a great reminder to keep at it. Thank you kids, and thank you Jen. Much of the summer has been spent doing what a kid should be doing in summer in Ireland. Cycling, swimming, and talking shite with friends! It's been a great summer in Ireland. Long days, warm nights; yum. There were a few festivals. Lisdoonvarna of course, was a great day, though moved from the west of Ireland to Dublin 4. The sun shone, we sang our heads off; lemonade and great gas! Parkpop in the Hague in June was also lovely; but my favourite festival this year was 'Feeling the World' in Antwerp. A festival for people who are fed up with festivals! I like it! Great food, relaxed people, good stage and sound; me happy. As well as my own gigs during the year, it is just so great to do some festivals and meet some singers and musicians, as well as people who visit the festivals. Much fun. Some of the summer has been quiet musically for me, as my old tendonitis condition has reappeared. I've been getting great treatment, and am fresh and ready for gigs and writing. As you will see from the site, there are lots of gigs coming up in Ireland. I recently realised that in the last 10 years I've done more gigs in Australia than Ireland, so I've decided to redress the balance a little. Between now and next March I hope to perform in many venues throughout the island of Ireland. This will include a tour of the north of Ireland, and a tour of County Dublin in late October, as well as a scattering of gigs throughout the country. I won't be leaving Ireland until next March, when I return to Australia for my 8th(?) tour. Yipee! So far, my favourite gig by another artist this year, was Mariza from Portugal, earlier in Dublin. My favourite movie so far is 'Goodbye Lenin'. My favourite book is 'An Unfinished Life', a biography of JFK by Robert Dallek. My greatest sadness is the ongoing tragic mess in Iraq. My greatest hope is for a hit next year, and I have a feeling in my waters it''s going to happen! As my brother Andy says, 'I'll see ye when I have my glasses on'. Greetings good people in Cyberia. I'm sorry I'm a bit late in wishing you all the season's greetings; been catching up on some sleep! I hope you have had a lovely Christmas, and that 2004 brings you all closer to your dreams; and is full of great songs and music for you. My favourite event of the year was the opening ceremony of the Special Olympics in Dublin in June. My favourite gig was Mariza in Liberty Hall in Dublin in March. My favourite CD was Stan Getz in Montmartre. Favourite movie was Rabbit-Proof Fence. Favourite book was a biography of JFK by a guy with a funny name. Had a few great gigs meself, thank God. Hard to pick one. Lisdoonvarna in Dublin 4 was great. The world festival in Antwerp was great. Loved the US tour, especially The Knitting Factory in Los Angeles, and The Great American Music Hall in San Fran. Love San Fran! I give up; they were all great. Thank you all, from the bottom of my heart, who came to my gigs this year; who bought 'Amsterdam', who made it possible for me to keep living this life of song I love so much. Being an independent artist is a great and challenging thing. It's easy to be unnoticed, and so it's easy to feel this work has little value. Your encouragement and enthusiasm is a great inspiration to me. THANK YOU. So, you have just spent Christmas doing what you do, and you need a little rest. Well, in the coming weeks, I will have on the website, and only on the website, a new CD. It's called 'Before Sleep Comes'. It's a special CD, designed to give people something calm to listen to before going to bed at night. It is 28 minutes long, 9 tracks, two of which are instrumental. I got the idea for the CD in the Summer, when my tendonitis was bad, and I was playing soothing little things on my Spanish guitar. I grew to love this time each day; wrote some soft songs; decided to record it in the Old Mill nearby. Finally, my favourite news of the year was confirmation of my next Australian tour in March and April. Details are at the bottom of the page. The tour ends in the Byron Bay Blues/Roots festival. Yipee!! Happy New Year to ye all; be well, pedal on etc. P.S. New Year's wish: Hilary for president and Kildare for the All-Ireland!
. . . 2 0 0 4 . . . Sadly I have to announce the fact that I won't be going to Australia for this tour from March 24 to April 9. I have a throat condition which needs healing time, and sometimes you have to listen to the body! Whenever I go to Australia I always want to give 100% because I love it so much; and so we are doing everything possible to reschedule the tour for March/April 2005. To the people of Adelaide, Perth, Canberra, Melbourne, Sydney, Brisbane, and Byron Bay who were expecting the shows, I'm sorry for not being there to sing for you. When I come back to Australia next year it will be great, and we will have big fun. To all the people involved in the setting up of the tour, I'm really sorry for the upset this causes. I thank you, and really hope I can do a great tour with you all next year. First things first. Again, sincere apologies to all in Australia. I was a little bit heartbroken not to be singing there. Sometimes you have to listen to the body, even when you don't like what it's telling you! I really hope I get to come back soon, and make it up to you. 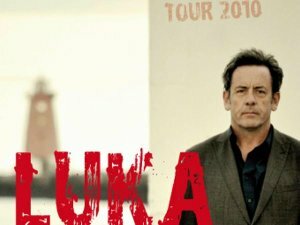 Then I play The Helix in Dublin on the 15th of May, and the Pavilion in Dun Laoghaire on the 29th May. Two great venues, and a chance to air some new songs. It's off to the US in June, and I can't wait. After much consideration, we decided to keep the US tour tight. The reason for this is that I'm writing for my next CD now, and don't want to be away from that work for too long. Short trips suit best, for now. The other piece of joy regarding the US dates is that I'll be joined by Alyanya, who has supported me in Europe before. I know US audiences will love her. My show is very different now. Different energy, different songs. I'm loving it, even though it's early days. It's a great challenge; I hope you'll come and check it out. Greetings from a sunny Ireland. This is a gas old year indeed. It started with uncertainty; my tendonitis restricting guitar work, and then a throat problem which caused the sudden cancellation of my Australian tour. It's a weird thing when you are gearing up for travel and songs, only to be stopped in your tracks. So I went quiet. And indeed it is an ill wind that blows no good. 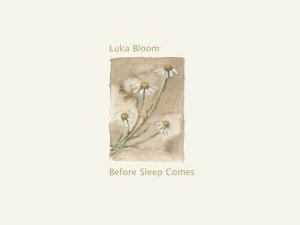 For in that quiet time, we put 'Before Sleep Comes' on the website with no fuss and no expectation. It is a very happy little baby, with its own wings. It is now available in Ireland, Holland, Belgium, Switzerland, Germany and Australia, and will be released in the US in September. No campaign or marketing or PR; just a CD with a life of its own. It has brought me good luck, and I am grateful for its ongoing journey. Some of you will have noticed that there is a bonus track on the Australian version. I wrote this song 'Saltwater' when I realised I couldn't do the tour this year. I don't get to Oz too often, and felt I owed the Aussies this bonus track. Simple as that, really. Through these quiet months, I got into a new writing groove. And as some of you know, I have penned a lot of songs now and yes, the work on the new CD will begin soon, though, knowing me, it will take time before it reaches fruition. I HOPE to have this ready for next spring, but time will tell. I feel happy with the songs, and already love singing them. It's all a little different, but that is as it should be. Life moves on, and so should the songs. Already, I've been singing these songs in shows, and look forward to doing some more before the winter. Such a great life, this is. Thank you to all who have said such positive things about 'Before Sleep Comes' and thank you to those who have come to the gigs this year. Personally, if someone told me in mid-January that by mid-December I'd have a new CD finished, I simply would not have believed it. Between tendonitis, and then the throat, I thought this was going to be a tricky year. But as Woody Allen said: 'The heart is a resilient little muscle'. So here I am at the end of the year, with the new CD 'Innocence' waiting to be released to the world in the new year. God is good. 'Innocence' will be available on the site in mid to late January. After that in various countries as the year progresses. I can't wait. Well, I can, but you know what I mean. The success of Before Sleep Comes blew my mind, obviously a lot of insomniacs out there. Seeing Planxty in Vicar Street after 25 years was really beautiful; now I'm guesting with them in Dublin, Belfast, and London. Thank you. Hanging out with the world champion tug of war women in Milwaukee was a major blast. The Rivierenhof in Antwerp was special, as was The Seamus Ennis centre in Naul, County Dublin, with Suzi and Claudia. But in truth, this was a quiet year; at home a lot, writing, singing and then recording new songs in my home in the bog. My only disappointment was not getting to Australia. We'll rectify that in March' 05! I loved 'The Motorcycle Diaries' and an Iranian film called 'The day I became a woman'. I loved hearing Yasmin Levy in Amsterdam. Two biographies, one of JFK and one of Dylan kept me reading, as did 'The Power of Now' by Eckhart Tolle. Willie Nelson, Leonard Cohen, Gillian Welch, Oi va voi... lots of new music from young and wise guys. I'm just so happy to be here still singing me songs. Thank you to Niall, Anne, Turlough, Pauls, Brian, all the people who keep the gigs going, and help me make CDs. Me hopes ye all like 'Innocence'. I've a good feeling in me waters about it. I hope ye all stay safe and well in 2005, and come a little closer to your dreams. Se ye down the road in some little hall near you. I'm ending the year, thinking about people in Southeast Asia. People by the sea, who love the sea, taken by the sea. Rest in Peace to them all. I was going to go surfing in Sydney this year. I might stick to the bog-snorkelling now!
. . . 2 0 0 5 . . .
After coming home from Belgium, after doing 22 gigs in 35 days in 4 countries, I was in no shape to remember my name, never mind the years' highlights. Had some rest, and some good times with my loved ones, and can sit and reflect for a moment on 2005. To begin, I must thank all the people who have worked with me this past year and made it possible for me to release a record and come to so many places to sing my songs. Niall, Turlough, Anne, Usna to name a few here at home in Ireland. Adrian Bohm in Australia, Reto in Switzerland, Ro bert of mojo, and the the good people of Bertus in Holland and Belgium. Teddy in Belgium. Karsten Jahnke and Skip records in Germany. Ulli in Finland. It is one of the great, thrills of my working life, to work with great people. after I've written the songs, I rely on others to help bring the songs to you on record and in concert. Thanks also to Paul Scully and Brian Masterson. To begin, I must thank all the people who have worked with me this past year and made it possible for me to release a record and come to so many places to sing my songs. Niall, Turlough, Anne, Usna to name a few here at home in Ireland. Adrian Bohm in Australia, Reto in Switzerland, Robert of Mojo, and the the good people of Bertus in Holland and Belgium. Teddy in Belgium. Karsten Jahnke and Skip records in Germany. Ulli in Finland. It is one of the great thrills of my working life, to work with great people. After I've written the songs, I rely on others to help bring the songs to you on record and in concert. Thanks also to Paul Scully and Brian Masterson. Paul mixes most of my shows, and Brian has mixed all of my last 5 records! Thank you so much to all of you. Had some sweet nights in Ireland as always. Vicar Street in February was great, because it was the night we released 'Innocence'. But my highlight in Ireland this year was an afternoon in Belfast, in a bar called Roddy McCorleys. I was sharing a singer/songwriter thingy with Damien Dempsey. He sang 'City of Chicago with me'. Goose bump vibe. Had an absolutely horrible gig in Ballycotton, County Cork, but it was cool, because I got to stay and eat in the legendary Ballymaloe House. Yum. Basically I love the small summer shows in Ireland. Love the nature, the driving, and meeting the locals and the travellers. Recorded a DVD in the summer in Dublin, and hopefully it'll be out in 2006. Had a great night in Vicar Street with my brother Christy, Declan Sinnott, Damien Rice, Freddie White, Mary Coughlan. 'Twas a benefit for New Orleans, for the US Red Cross, and also the Choctaw Tribes who were badly hit in the area. Had a ball in Finland, especially Helsinki. The Eurotour in autumn was mad and great. My highlight of this tour was Lucerne in Switzerland. I'd never been before. It is a divine small city, and the gig was just joyful. I loved Berlin; the gig was beside the old wall in the Postbahnhof, an old converted barn of a place. Odd, mad and great, reminding me of my time living in Berlin in 1974, singing in tiny bars called The Zillemarkt, Go-in, Bleibtreu cafe......good old days, but not as good as these days... Loved Haarlem; a gorgeous roundy, woody room full of people, yeah! In Belgium, I loved Leopoldsburg, and the second show in Beveren...... Ah but you know, after the trickiness of 2004 with my voice, it is just great to be singing and to be loving singing. Thanks so much to all the people who came to all these shows. Every one of them counts. Every one of them is special. Big thanks to Gavin Moore and John Spillane, who sang with me in Germany and especially Sabrina Dinan, who made a lot of friends as my guest in Holland and Belgium. And the journey of 'Innocence' continues. The big deal of 2006 for me is the coming release of 'Innocence' in the good old USA. The record comes out in March, and I'm in training for the big tour in April & May. Possibly as many as 25-30 shows all over the place, in familiar cities as well as cities I've never sung in before. It's been a long time since I've committed to a tour like this in America, but I really want to sing these songs there, and meet lots of people on the way. Simply can't wait for it. And there will be a few Canadian shows also! My book of this year is a very simple book called 'Last Words'. It is available from Kilmainham jail in Dublin. The book contains the last letters of the leaders of the 1916 Easter rising in Dublin. A visit to Kilmainham, and the reading of this book, gave me a deep sense of gratitude to these men. I believe their sacrifice resulted in the creation of our Republic, and therefore is part of the reason I am an Irish citizen and not a British subject. I also started reading a little book called Ulysses....! My other heroes this year are the parents of Ahmed Khatib. Ahmed was a young boy, shot dead by an Israeli soldier in Palestine in late 2005. His parents had Ahmed's organs removed, and used to save the lives of Israeli children who were in desperate need of transplants. Ahmed's mother and father should be given the Nobel Peace Prize for 2006. PS: Sweet dreams Johnny Cash. Thank you for being you among us, and for walking the line to the end of the road.
. . . 2 0 0 6 . . .
At last, here are the dates for the US tour, starting in Wolftrap near Washington DC on April 5th, roaming around the US for over 6 weeks, finishing in Morristown, New Jersey on May 17th. By the way, Sabrina Dinan, from Ennis in County Clare will join me on the tour. She will be opening every show for me. Sabrina did the shows in Holland and Belgium before Christmas, and was a great hit. I think the US audiences will love her. We will be doing our utmost to ensure that every single gig is a special evening for us all. I can't wait, and look forward to lots of happy nights throughout America. I am working on two records at the moment. I'm writing away for the next solo record, and that will take at least a year to bring to fruition. However - I have been quietly working away since November '05 on a very different project. It's a collaboration with a great musician and music programmer who lives in County Clare. His name is Simon O'Reilly. Simon works all the hours god gives on his music, and when not doing that he surfs the sea below the Cliffs of Moher. I heard his record 'Tidelines' last year and instantly wanted to work with him. For years now, I have been waiting to meet someone with whom I could collaborate like this; and I am really enjoying this process. However, because it is such a different project, I have decided to take a new approach to releasing it. We have on the website, a rough mix of one track for you all to hear. It's called 'I Am A River', and is representative of the feel of the record, though there are some really different tracks also. If enough of you like the sound of this one track, and are willing to buy your copy in advance - like immediately, this money would help finance the finishing of this record. If say, 1000 people were willing to buy the record for 20 euros; that 1000 people would receive a copy signed by Simon and me; and you would receive a bonus extra track for your gesture of good faith! We expect to have the record ready for release by February 1st 2007. I hope you enjoy this one song, and really look forward to letting ye hear the whole record. p.s There will be an announcement regarding the DVD in a few weeks. We're getting there! I hope you are all enjoying the turkey or the nutroast or whatever tickles your fancy at the end of another mad year. The solstice has come in the northern hemisphere bringing us some gorgeous frosty days of sunshine here in the costa del bog. And bringing promise of new life in 2007. First things first. Regarding new cd and dvd........ purely by a strange coincidence, the cd and dvd are finished at the same time. 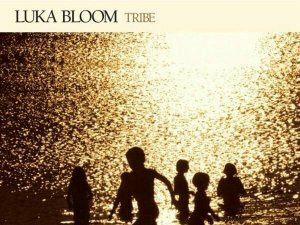 They are completely separate projects, but there you go..... As my working life is driven by new music, the first of these two offerings to emerge into the light of the new year will be TRIBE, my new album. It will be available, we hope, by Feb 1st on the website. Some of you know by now the record is a collaboration with Simon O'Reilly. Simon is from Dublin, but has lived for 6 years beside the Cliffs of Moher in County Clare. He has created great music through the years, and we have spent the last year creating this record, which is now complete, and we both love and are very proud of it. Many of you have grown a few grey hairs, or maybe lost a few, whilst waiting for the dvd. the good news is its done; but I've taken the decision with approval of the team who created it, to release the dvd on april 1st, after people have had a chance to taste the new music. The dvd was a complex little project that ended up needing all the time we've given it. We hope sincerely the wait will be worth it, and thank you for your patience. 2006 was a mad year. My main focus was the work with Simon, but I continued running around the place singing songs from innocence and more. There were many fantastic nights. I did the longest tour in the US for a long time. 30 shows in so many places. Travelling in the US is not the romantic experience it used to be, particularly if there are a lot of flights, but as always it was so worth it. It's not fair really to select nights as favourites, but I will anyway. The great American music hall in San Francisco was a totally magical night, as it always is there. Just one of the special music rooms. There were also magic nights in Denver, Seattle, Washington DC, Boston, Atlanta..... but the night that really stood out for me was my first night in BB King's on 42nd street in good old New York. It was a saturday night on 42nd st, and I was a little anxious that the atmosphere might not be right; but I was really blown away by the venue, the staff, and the amazing audience there. On that tour, we also had a great break in Boulder, a little piece of heaven in Colorado. But my abiding memory of the tour in the US was the reaction in every audience to the first song of each night. I decided to open every show with 'I am not at war'. I was a little unsure at first, but every single night the song was received with really prolonged positive reaction. And as we know, more and more citizens of the US and elsewhere are asking how and why this war in Iraq ever became a reality. We are one and all affected by it, but I am grateful to the people who came to my shows in America for allowing me to experience their upset and worry at the execution of this war. The show that stands out last summer for me, was a magical night in June, on the edge of the southwest of Ireland in County Cork. The place is Dzogchen Beara, near Castletownbere. A buddhist centre in the Tibetan tradition, and a truly wonderful place. The occasion was an evening to celebrate plans to build a buddhist care centre for the dying. A lovely evening, sun coming through the window. A lovely crowd; no sound system, very special feelings. Apart from my own work, there were only 3 gigs I got to this year which I loved. Camille O'Sullivan in the Olympia in Dublin put on a fantastic gig. Anour Brahem from Tunisia performed in the National Concert Hall in Dublin. This man's music is so divine. His last record is on ECM, called les Voyages de Sahar (if that's the right spelling). And then there was the Blue Nile in Vicar St. in Dublin. Paul Buchanan is my favourite white male singer. Without effort, he moves me to tears. There is an emotion in his delivery which is understated, and absolutely devastating. Saw some great movies this year. 'Sweet smell of success'; 'Garden State', 'volver', 'Sideways', 'Joyeux Noel', 'Big Country', and a little korean movie called 'coming home', to name but a few. Didn't read enough this year, but the one book that really affected me was a book called Loving Kindness, by Sharon Salzberg. I always like to reflect for a moment at the end of the year on the people who gave us music who are no longer with us. And 3 giants spring to mind whose work will live on as long as people are listening to music and songs. The incredible Johnny Cash, who gave me great hope, by doing his best records at the end of a long and brilliant music life. Frank Harte, who simply was a precious irish treasure, who both collected and performed incredible Irish songs throughout a rich and long life. Frank made many records, one of the last of which was a collection of famine and emigration songs, called I think, The Hungry Ghost. It was recorded with Donal Lunny. The last song is City of Chicago. His version was so lonesome and beautiful, that I found myself singing it again in a whole new way, and finally recording it on Innocence. Thank you Frank. Finally, on a personal note, I was deeply saddened by the too early death of Micheal O'Domhnaill, who was a friend, as well as one of the great Irish guitar players. Micheal was simply a gentleman, who made beautiful music with The Bothy Band, Nightnoise, Skara Brae, Paddy Glackin, Mick Hanly, Kevin Bourke, and many more. He was an inspiration to me and I miss him very much. That's a wee snapshot of 2006, as much as I can remember...... I can't wait to release TRIBE, and see how people react to it. I cant wait to go to Australia for my 8th tour I wish all who read this a very happy Christmas, or happy holidays in america! And I hope our paths cross in some club or theatre in 2007, and may your year to come be full of fun, and great songs and music.
. . . 2 0 0 7 . . .
Greetings from the costa del bog, where the spring has sprung with a summery glow to it, and no one is complaining. I've just come in to land from Australia, where once again, the experience of being on tour was simply a privilege. I know how fortunate I am to have this job, and that good fortune becomes even more apparent when I get to sing in Australia. We had great shows; Sabrina again proving to be a knockout for the Aussie audience. A special thank you to Adrian Bohm, who has promoted every show I've ever done in Australia and is a true friend. People have been enquiring about the release of tribe in various territories. The news is that I have decided to be very patient about releasing tribe, because I want it to be right in every country, and sometimes that takes time. Holland and Belgium on June 18 with v2 records. Germany, Austria and Switzerland on June 22 with Skip records. I will let you know as soon as other territories are confirmed. One last thank you to the people who came to the aussie shows and sang Tribe with me. Hows things? Just a little update from the Costa del Bog in deep Kildare.. We had such a blast launching TRIBE in Amsterdam, Utrecht and Brussels. The Amstelkerk in Amsterdam was a gorgeous setting for the event. It felt really good to sing there; and I say thank you to V2 and to everybody who helped get this record off to a great start in Holland and Belgium. Next week I'm off to Norway for some shows including a Full Moon Festival. Sounds like a hippie lovefest......Hope so! July will be mostly quiet, as it should be, because its summer in Ireland, and the bike and the sea are calling me. However on Wednesday 18th of July I will be in Derry in the Millenium Forum, for a very special event, during which I will sing to welcome the Dalai Lama to this great Irish city. The event is the 10th birthday of Children in Crossfire. Here is the information: www.childrenincrossfire.org. Wendy Grace from Uki in New South Wales, Australia, sent me this version of a great bunch of kids singing 'I am not at war with anyone'. Wendy recorded it with the assistance of Harmony Joy Church (a woman not a cult!!). Since writing this song 4 weeks before the war in Iraq I've been amazed by the life the song is having. Different versions of it keep appearing from around the world - people are keen to express the way they feel about this and all wars. The chrimbo is upon us again. Time to reflect on the year just gone and begin to dream, again. For those long-suffering dvd watchers........I can ABSOLUTELY CONFIRM that the dvd will be available on the website from February 1st. No ifs, buts, doubts nor maybes. The dvd, entitled 'The Man is Alive' is done and dusted and ready to make its way around the world to those of you who have patiently waited for this eventuality. I thank you for your patience, and really hope you will feel that the wait has been worth it. 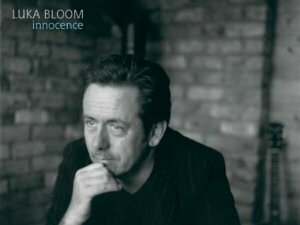 All I can say, having never released anything 'visual' before, is that it is a comprehensive package, including a show in Dublin, a show in my home in Kildare, a cd, a documentary and a question and answer session......I'm tired just thinking about all the work so many people have done to bring us to this hour. Well done Union Station Productions; take a bow! As always such a beautiful experience to travel to Australia; and to sing in some of the great places there. It really has become a home away from home, and 8 months later, I already miss it again. Thank you Adrian Bohm and all the great people who work with you, for continuing to bring me to your country. These shows always fill me with joy. I love Australia; and even more now that Peter Garrett and his team are in government. Interesting times in Oz. Can't wait to go back, especially to Fremantle. Throughout the year, I had many shows in many places in Australia, Norway, Germany, Holland, Belgium, Switzerland and the UK. I loved the atmosphere in the church in Cologne, the amazing energy of Tivoli in Utrecht, the buzz of the cinema in Lausanne...... But in truth the highlight of my year was the moment in Derry when I sang for his holiness the Dalai Lama at the 10th Anniversary of Children in Crossfire. In a moment like this you feel the sense of privilege you should feel every night, being given the opportunity to sing for people. And this event in Derry resulted in a second highlight of my year. Namely the opportunity to sing with the beautiful and gifted Christie Hennessy, who died on Dec 11th. Christie knew he was dying, and was determined to finish his record, despite the incredible difficulties associated with this determination. He wrote a song about Richard Moore of Children in Crossfire and the Dalai Lama. He asked my brother Christy and I to sing the song with him for his last record. This was one of the unforgettable moments of my singing life. Singing with my brother and Christie, knowing that this great man was soon to leave us. A truly sacred day. Christie Hennessy was and always will be, a legend. Through his voice and the songs he left for us, he will always be with me. I loved all my gigs this year, and simply say thank you to all the people who worked to make my gigs happen; and a special thank you to all the people who came to the shows. Also this year, I released Tribe, a collaboration with the wonderful Simon O'Reilly. We had fun making the record, and as always, it is just a great buzz to have a piece of your work out there in the music world. What did I hear in 2007? My favourite shows were Xavier Rudd at the Roots and Blues festival in Fremantle. I wasn't aware of him before then, and was amazed by his songs, his spirit and his phenomenal musicianship. Also India Arie in Tripod in Dublin was fantastic. But the event of the year for me, was the celebration of the life and music of Micheal O'Domhnaill in Vicar Street in Dublin. Micheal was best known for his playing with the legendary Bothy band in the late 70s and early 80s. He was a great guitarist, singer, producer, but more importantly he was a great gentleman, and we all miss him. The show in Vicar Street was an evening of great songs and music by the cream of irish artists who worked with and loved Micheal. Fab. My favourite record this year is by far the Robert Plant and Alison Krauss collaboration. I think it's called Raising Sands or something like that. Produced by T-Bone Burnett, the songs are great, the music and playing are great. It sounds fantastic, and the 2 voices are perfect together. A rare treat. My favourite book was the harrowing and beautiful 'A long long way', by Sebastian Barry. I know I saw a few good movies this year, but its midnight and I'm suddenly exhausted..... loved 2007; can't wait for 2008. 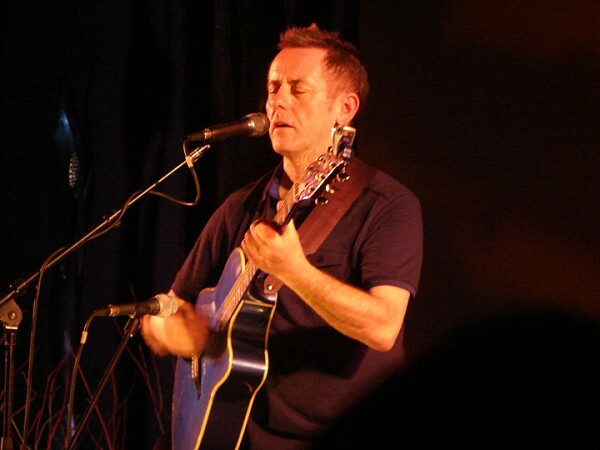 Working on a new record; thinking about gigs, wondering who'll be in the White House this time next year........So much fun to be had.
. . . 2 0 0 8 . . . I hate watching violent movies. Always did. whenever I find myself watching one, I look through closed fingers, and wait for the hard parts to pass. That's what it was like last night trying to watch the new DVD for the first time. I loved the bits in the documentary section where I'm playing with friends, or walking with my sister; but I couldn't be looking at or listening to myself talking so much. The only part of the DVD I could watch without freaking was when I was playing guitar, because it's the first time I've watched myself do that, and I still have no clue what I'm doing, which is a bit of fun. What I'm saying is I would never have done this. Only for members of my family and a few people close to my family, the DVD would never have happened. Niall, Usna, Turlough, Anne, and all the people they assembled, made this happen. They started to ask me about it 3 years ago and I didn't want to know about it. Just let me write songs and sing them and I'm happy. But the lads just thought it was time for this, and they persisted. I thought they were mad. So many great people came over to Dublin for a mighty night in the Helix. From all over the place. We had a lovely time. I'm not going to go into the details of the delay in getting the DVD finished, but I'll just say there were serious issues with the Helix gig from a technical perspective. We lost all but 50 minutes of the gig. I was prepared to let the project go, but Niall and Usna persisted, and in time they rescued enough of the show to consider finishing. Then I got the idea of bringing a few people round to the house for a Saturday afternoon, to get a different buzz. And all of a sudden nearly 3 years later here we are. 2 gigs, a bunch of songs, way too much of me talking shite. I can't watch it, and I never will again. But for people who like these things, I hope the DVD satisfies your curiosity. And I hope you enjoy the songs, and the shots of the Burren. I've learned something from the DVD, and I'm grateful for that. It's great to sing and play music. But maybe not so great to be trying to explain yourself. Maybe there's no need. Maybe it is best to sing the song, and then shut up. I think so. This was a long tough road, especially for Niall and Usna at Union Station Productions. I thank them and admire them for their resilience and conviction. And I thank all the people who helped put the 2 gigs together. But most of all, I thank the people who took time and trouble to travel to Dublin to attend the Helix gig. We really hope the wait is worth it for you now. It's great to have it done. My God its May already! How does that happen? January lingers eternally, February drags on, then you wake up one day and its MAY! Its a sudden explosion of colour everywhere (except Australia, sorry!). I just returned from a really enjoyable tour of the UK. While I've done many shows down the years in various cities in the UK, this past year is the first time I have tried to begin the process of returning regularly and singing to the nearest neighbours. And it is really enjoyable to do it. Take the ferry, and drive through that glorious countryside, having ye olde pie in the yummy Inns that still thrive in rural UK. Then go to great venues and sing for willing audiences. Its a lovely feeling, starting out in a country which still feels very new to me, making some new friends. Thanks to all the people who came to our gigs from Edinburgh to Brighton and places in between; and a big thank you to Jane Skinner who made it happen. At the minute, I am getting ready to face the last stretch of road in bringing the record home. As we have yet to mix it, I won't say too much, except to say that we had a really fantastic time recording in Grouse Lodge in County Westmeath; a truly magnificent place to work, run by fantastic people. The hope is to be finished in mid to late June, and look to release it in autumn (Spring in Australia!). There will be lots of gigs. Beginning with some east coast shows in the USA in September; Ireland in September, finishing in Vicar Street Dublin on November 1st. - then Belgium, one Amsterdam gig, and Switzerland in November and finally Germany in December. Then somewhere between Late February and late May 2009, the USA and Australia. That's just a rough sketch for now. The dates will be finalised as confirmed on the website. The work goes on. Life is good. It is so good to able to make plans like this and continue to get out and sing my songs for people. The organisation is mildly chaotic, but somehow we get there. We all show up and off we go. Happy days. Finally may I take this opportunity to recommend a band for you all to check-out. They are called Rachel Unthank and the Winterset. Went to see them last Sunday evening in Whelans in Dublin, after my gig in Belfast (don't ask!). Having heard their two records, I was keen to hear them live, and they were fantastic. Four women, celebrating the beauty of English song, with really interesting music and a very unique contemporary take on great ballads. Not to be missed in my humble opinion. www.rachelunthank.com for dates in the coming months. OK, the kettle is boiled, the sun is out; I'm off to the hammock for the afternoon. The gorgeous low winter light is all around. The Christmas dinners wind down, the quiet begins to settle in. It�s a strange limbo-esque week between Christmas and New Year. Waiting for something to happen, then it happens, then its Friday and off we go again.... Before the year passes on, I just want to wish everyone a very Happy New Year, full of new adventures, friendship, love and great music. And I want to say a big thank you to all the people involved in helping to keep this music and song life moving in 2008. All the people who promoted the gigs in America, Ireland, Scotland, England, Germany, Belgium, Holland and Switzerland. So many great nights, so many special memories. For some reason I always try to highlight moments from the year; it�s just a silly habit. I loved playing in London this year, twice even! Union Chapel and Bush Hall are really lovely, but very different places and both were really great to sing in. It's always a special feeling to return to New York - I just love it. I've become a big fan of the mad Celtic Connections Festival in Glasgow, which kicks in the year very nicely thank you. The little tour around Cork and Kerry in summer with Niall was great fun. Belgium was fantastic this year, especially the night in Roma in Antwerp, which is a remarkable place run by remarkable people. As always, the gigs in Switzerland are funky and different, expecially Mokka in Thun, which is a very interesting place to study human nature..... It�s a great country to sing in, with very kind and warm audiences; I especially loved Kammgarn in Schaffhausen, and L'echandole in Yverdun. Germany is always great, mainly because the people in Karsten Jahnke's office in Hamburg are so fantastic and make every tour special for me. Finally I found Quasimodo in Berlin, which I loved for its atmosphere and great club sound. But my favourite night in Germany was in Munster in a beautiful baroque hall. The sound was natural and great, the audience really open. Though I was struggling with a cold, the gig was great, and the people helped me along with their sweet singing. And then there was Vicar Street in Dublin. What a treat to sing with Dave and Trevor, and then Conor and Robbie. That was a really special occasion. I'll not forget it. But the big night of the year for me, was in Paradiso in Amsterdam. It�s easy to take a room for granted, after so many nights over 18 years. But once again, that room took me in, the people took the songs and off we went together. It just feels like home to me. I know it is on film, and I hope the film is ok; but it can't really capture how great it feels to sing with everyone in Paradiso. These are tiny snaps of what was a mighty year, full of great nights. Thank you so much to all concerned, especially Paul Scully, my friend and supreme soundman. Thanks also to Jane Skinner. To Usna, Turlough, Dom and David at Pointblank for all your help with the website and all things technical! To my sister Anne at cd headquarters in Miltown Malbay. To all the fantastic people who played and sang and helped bring ELEVEN SONGS to the light of day; especially David Odlum. To Pascal van de Velde; Carlos van Hijfte; Karsten Jahnke; Fig; Katharina and Martine; and Tim Drake, for promoting me in the countries I sang in. To Rena, for the German website and the forum. Apologies to anyone I've neglected to mention. I thank you. It�s early and I need the porridge now. Finally thank you to all the people who invested time and money to visit a gig, or buy a cd or dvd in 2008. I hope it was worthwhile for you to do so. Without you, I can't do this. Many many thanks. The singing life goes on, and here's to more big nights in 2009! Finally, this year I went to only a few concerts. kd laing was amazing in Glasgow in January, as was my brother Christy with Declan in Vicar Street last week. But the highlight of my year, and the best gig I ever attended in my entire life was Leonard Cohen in Dublin in June 2008. It was a master-class in everything I want to do professionally. 12,000 people in the open air in an atmosphere like an intimate folk club. We were his best friends and lovers for nearly three hours. It was heaven. Thank you Leonard and crew. I heard some good records this year, especially the new Elbow record which I love. But the stand out record and discovery for me this year is by an artist called Deva Premal. The record is called Dakshina. It was given to me along the road (thanks) and I listen to it every day. Deva and her partner Miten create beautiful music and songs using mantras and chants. Her voice is among the most beautiful I have heard, and I have the feeling that this is a music life which they literally live each day together. Very special, and I am grateful for it. Another year is almost gone. It�s such a great time to be alive.
. . . 2 0 0 9 . . .
Don�t be afraid of the light that shines within you. 2 chords, 2 verses and a chorus. Very simple song, and yet it says everything I want to say at the beginning of 2009. This song was not created in a vacuum. It is not something I simply dreamed up one day. Since 1993, at the start of every February, I have watched large groups of men and women gather in my home county of Kildare. They come to welcome the beginning of spring. they come to Kildare because it is the home of Brigid, whose feast day is February 1st. Brigid is the goddess of love, poetry, justice in prechristian Ireland, and she is the patron saint of Kildare. There is reflection, talk, music and dance. It is not a big trendy festival, but a gathering of people who want to celebrate the coming of spring, and who want to call Brigids� qualities into the world, to light a spark for change. And every year we gather to welcome the light into our world; and to hope that more light will shine in the world; and that someday out of the darkness of war, hunger, greed, poverty, will come the light of community, sharing, justice, music, dance, peace and love. I wanted to write a simple song to share with everyone in Kildare, and to honour this noble celebration. I wrote the song around 2000 and for some years I only sang it in Kildare, and often only in February. I thought about recording it, but the moment never felt right. In 2008, I felt a momentum within myself, which resulted in the record �Eleven songs�. And in that momentum I also felt a surge of energy around this song �Don�t be afraid of the light that shines within you�. I knew that it was not enough to simply record the song. It had to be BIG. Most of my recent recordings are intimate and personal. But this song insists on being as big as is possible. It is a song which wants to explode into the world; and it�s time has come. Even at the point of recording the song in April 2008, I could never have foreseen the hurt that people are feeling around the world in a few short months. At the end of 2008, everywhere is fear, insecurity, corruption, unemployment... And yet, I feel this is the most exciting moment imaginable to be alive. There is such a window opening in the world for goodness, for community, for sharing, for simplicity, for kindness. And this song is a call to people, to reach inside and be aware of the power in each one of us to do good, for ouselves, for our families, for our friends, for our villages and towns, and ultimately, for our earth. In these dark times, many people feel powerless, unimportant, un-needed, marginalised. This song came from the power of a group of people who want to shine a bright light for the earth and for humanity. We have shared it together for 15 years now. And now I want the world to hear it. I never speak so openly about my songs, and I never really �push� them. This is different. I know that many people need to hear and feel what is contained in this song, right now. I know that songs of themselves don�t change the world. But songs can also be prayers, blessings, and they can be a spark to ignite something beautiful in anybody.. This song is my prayer for the world, and I send it out at the start of this exciting and dangerous year, with love and hope in my heart, for our shared future. January, 2009 could mark a great beginning. St. Patrick's day approaches, and I prepare to head to my southern haven in Australia. So good to return to meet my friends and sing my songs. This is a great blessing; it's the only way to describe it. Speaking of St Patrick's day, this one in 2009 is a very special date, not just for the people of Irish descent around the world. For it was St. Patrick's day 1959 when the Dalai Lama and a large group of devotees escaped from Tibet across the Himalayas into India where they still live to this day. 17th March 1959 was the last day The Dalai Lama saw his home town of Lhasa. We Irish have a long history of oppression and exile. Perhaps this year when we celebrate St. Patricks day around the world, we might spare a thought for the people of Tibet. People scattered around the world, bringing us all their beautiful philosophy of life. And also the Tibetans still at home, suffering under a regime which denies them their basic right to practise their beliefs and celebrate their rich cultural history. Here's a version of 'As I waved goodbye', which I wrote in 2000 for the Dalai Lama. We recorded it in Whelans in Dublin February 26th just past. Off to get the factor 30 sunscreen. What a strange, wonderful, sad and beautiful year it has been. Ciaran MacMathuna, Liam Clancy, John Martyn...... just three huge names which roll off the tongue. Names belonging to men who are no longer with us, men who in different ways have had a huge impact on my life in music and song. Rest in Peace to all the heroes no longer with us in body. Your spirits live on with us, and we are better people for having shared life here with you. 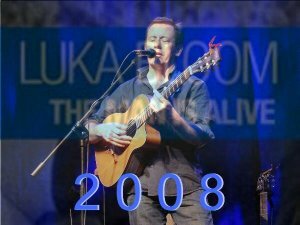 As I look back over this year, I'm a bit gobsmacked by the number of shows I've played in 2009, and how much fun they all were; how different they were. It really is tough to select shows which stand out for me this year. The first (of 2) show in Byron Bay in Australia, The Stone Mountain Arts Centre in Brownsfield Maine, The City Winery in New York, AB in Brussels, the old church in Ottersum in Holland, the tent in Dzogchen Beara, Ryston in Newbridge, the old mill near Bern, the courthouse in Tinahely.......... If I am forced to select a stand-out moment for me this year, it would be singing for the first time with an orchestra, in the National Concert Hall in Dublin. This was an immense privilege, and I was thrilled at how well the songs translated both in the room and most of all, with these incredible musicians. We are all very keen to repeat this experience, and somehow, we will. But to be able to keep doing this, writing and singing for and with people, in different parts of the world, is just fantastic. So I find great moments in every gig; this makes it hard to choose one. Anyway, again, thanks to everyone who made these gigs happen; to everyone who played with me; and most of all, to the people who came, and who sang the songs with me. I didn't read much this year, but I am currently loving John O'Donoghues first book of poems just rereleased, and I've just started Colum McCann's award winning novel 'Let the great world spin'. Nor did I see many movies, but I found The Anvil story hilarious and very moving. And Waveriders was touching as well; a movie telling the history of surfing from an Irish perspective. Lovely. So many people in the world, on so many creative journeys. It's good to be here at this wild time in human history. At the end of the year, I am putting finishing touches to a record which will be released in March. Now it is time for sleep, winter walks, visits to friends, turf fires, songs.....but mostly sleep. Thank you so much to all the people who worked with me in 2009. Thank you so much to all the people who came to the many shows in 2009. Thank you so much to all the people who bought records in 2009. It helps me keep the music flowing. Thank you so much to all the people who contacted the website to say hello. Everything will be new in 2010.
deserve in this, and all seasons.
. . . 2 0 1 0 . . .
That night in the Colony, there were four people at two tables. Two couples. I sang my heart out for two hours; old songs, new songs, gave it everything, as always. When finished, one of the men at a table asked me over to say hello. His name was Michael Jaworek, and he was honeymooning with his wife Debbie. Michael was, and still is, a much respected promoter in Washington DC. He gave me his business card; the first time anyone ever gave me such a thing, and told me he would get me a gig anytime I wanted to come to America. This simple moment lit a little spark within me. Hope.So many people were struggling in Ireland. It was unbearable for any of us to leave family, friends, familiarity. None of us wanted to go. But what was the choice? I joined the ranks of Irishmen and women taking the boats and planes in search of possibility. In the late '80s there were 100,000 of us in New York alone. 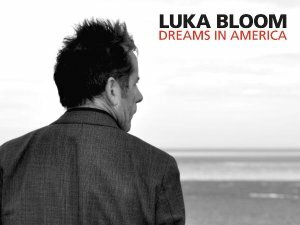 In heading to America, I also chose to acknowledge the utter newness of this adventure, by taking on a professional name, Luka Bloom. Hey, why not? This is for the songs. Let's see what's out there. It felt like the last throw of the dice. 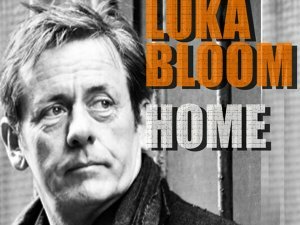 'Hi, my name is Luka Bloom. I'm over from Ireland, and would love to sing in your club'. This was my introduction to the music world of Washington DC, New York, Boston, and Baltimore. Up and down the east coast on the Amtrak train. 'ALL ABOARD!' Indeed. Dylans in Georgetown, DC; The Red Lion on Bleecker Street in New York, various bars in Boston..... For two years I jumped from one to the other, writing and singing non-stop. Coming into New York in the late 80s was overwhelming. AIDS, crack cocaine, wheeling and dealing as ever - too high, too fast, too big... It was terrifying for a young man from the plains of Kildare; and it was utterly fantastic. I realised one day that New York was as shocking for a man from Iowa as for a man from Kildare. I told myself to take a chill pill and give it time. It began to feel familiar. I walked and walked for hours, endlessly fascinated and thrilled and exhausted and scared and overjoyed. Some of the clubs had acts performing from 8pm until 4am every night, a new act every hour. I deliberately worked the midweek nights, to build up my own crowd, and little by little it began to happen. Over a period of two years I was taken in by the people in the Village. They minded me. They said thank you for bringing us these songs. And I began to experience that which is a clich� to many, but the reality for so many of us; a sense of hope and belief that maybe there is a place in this world for these songs. And it started in New York. In one intense period in early 1989 I met the people who became my managers, booking agent, record company, publishers for the next five years. All in the Red Lion, Under Acme, Urban Divide, The Knitting Factory, even CBGBs. Tom Prendergast, Glenn Morrow, Michael Hill, Frank Riley, Kenny McPherson, Paddy Doherty.... to name but a few. I still call you my friends, and I thank you - for they were magical days and nights. Suddenly, life was different. Everything changed after Riverside in 1990. Calls came in from Australia, Holland, Belgium, Germany, Switzerland, The UK, and of course, Ireland. Those days in New York changed everything. They opened the door to the world. It still amazes me. Some of it was tough. In pre-email, pre text and cell-phone days, contact with home was sparse enough. And there is only so much you can share in letter or phone. It aches to be away from the ones you love, but that is life for many of us. And hopefully, we do our best when we get back home. Twenty years later I decided to honour those times with a record. It is not a 'best of', with tracks lifted from old records. I chose to revisit songs from the last ten albums since, and bring them back to life with new versions. Sometimes it's a song I don't like the original recorded version anymore; sometimes it's just a new feeling for a song. Sometimes it's the words, sometimes it's the rhythm, and sometimes it's just the sounds on these guitars. This is raw. It's in my living-room. You can hear the guitar strap creaking off the wood; the fingers banging off the body. Hopefully you can feel the warmth in the room. It's about the songs, the sound of these strings, and most of all, the words. And, though I claim to be allergic to nostalgia, it is about the memories also, and they are so good. There were a few little moments when I felt like a king; just so happy to have arrived at a place where it was normal to be singing, not struggling to be singing. What a relief. I had this dream, and struggled with it. And in New York it became a reality, so strong that twenty years later the fire still burns stronger than ever. There is one 'new' song on this record. It is in fact, a very old song called Lord Franklin. I sing it in honour of my friend Micheál O'Domhnaill, whose version of the song was, and still is, the definitive one for me. And finally as this record is about the last twenty years, I felt it would be nice to include a few live tracks. 'I hear her, like Lorelei', and 'Love is a Monsoon' were recorded in the National Concert Hall in Dublin with members of the National Concert Hall orchestra in August 2009. And Sunny Sailor Boy is from AB in Brussels in March 2009. Brian Masterson engineered my first ever record TREATY STONE in Dublin in 1977. We've done a few together since, and here we are again, giving it a lash. Life is good.
. . . 2 0 1 1 . . . I'm dreaming of a Green Christmas, where I can see the fields again. The white stuff is pure and lovely and slows us all down; but it's tough for farmers and for the singers and the audiences and the postmen and and and sure we may as well get used to it! What a year 2010 has been. 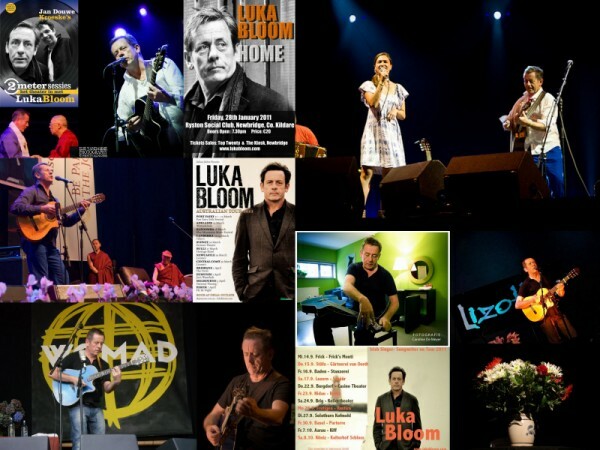 So many gigs I loved.The Kildare night in the Button Factory County Sessions; back in Tivoli in Utrecht in March; my favourite tour ever of Germany in April; some lovely festivals, especially singing on the beach at Oerol in Terschelling in Holland. Some great shows in the US and in Switzerland in the autumn. But sometimes it's the different experience that stands out. Just a few weeks ago, I did a small charity event in a very special place called Cornucopia. The weather and the state of Ireland just now has me thinking a lot about the homeless, so I asked Deirdre McCafferty (Cornucopia's owner) could I do a small benefit for Focus Ireland in her glorious vegetarian restaurant on Wicklow Street in Dublin. 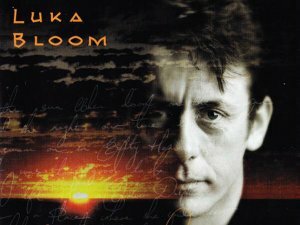 Cornucopia came into existence the same year as Luka Bloom, namely 1986. It has been the beacon of vegetarian eating in Dublin since then. Great food, great people. They marked the beginning of this great recession by extending in size; a testament to their determination and an acknowledgement by the people of Dublin, that Cornucopia was the right place for our times. Similarly, Focus Ireland has been doing incredible work for the Homeless in Dublin over many years; and we were deeply honoured that Sr. Stan was able to attend our little event. This was a very special evening, and I won't forget it. By the way, check out Cornucopia at Home (the cookbook). YUM! I didn't go to too many gigs this year, but did see some crackers. Imelda May in ABC Glasgow; yet another woman who makes me feel a warm glow in being Irish. A solid, sweet gifted lady. Leonard Cohen in Ghent in Belgium. A masterclass in poetry, sensuality, humility, grace and dark humour. Heaven. My friend Tom Prendergast insisted I check out young Ivan St John in the Working Man's Club in Dublin recently. Great songs, great 3 piece band, great fun. For the first time in ages, my favourite Cds this year were traditional Irish recordings. "Triúr" (Irish for 3), featuring Peadar O'Riada, Martin Hayes, and Caoimhin O'Raghallaigh. "Disgraced Notes" by Seamus Begley and Tim Edey. "A Moment of Madness" featuring Brendan Begley with Caoimhin O'Raghallaigh. These three records really capture some of the raw beauty that makes Irish music so powerful for me. One of my favourite books this year was called "The Kennedy Detail", and was written by one of JFK's Secret Service men. It's a very moving account of the last days of JFK's life, from a very intimate and unique perspective. I'm presently loving Geoffrey Wheatcroft's history of the tour de France, called Le Tour. It was a beautiful, challenging and intense year in our world. It will take more years to make sense of all that has happened. At this year's end, I am filled with a deep sense of gratitude to be alive at this momentous time. Most of all I am filled with a deep love of the country I was born in. It is where I started to sing and to write songs. And it keeps giving songs to me. In these strange and troubled times, we will return to the hearth, return to the songs and the stories, and together we will imagine and create a new republic. We have struggled before, and we will struggle again; and in adversity the best comes out of us. 2011 will bring great challenges and great change. Bring it on! For me it really kicks off in Newbridge County Kildare, on Friday the 28th of January. And then the road beckons once more. tickets available here. A big thank you to all the people who made my shows possible in 2010 and a big thank you to all the people who attended them. I wish you all a peaceful Happy New Year, full of songs and music and friendship. Be warm (in Australia be cool), be well. See you down the road at some sweet gig in 2011. Greetings from the Costa del bog. What a year so far, and it's only March. My working year got off to the absolutely perfect start with an unforgettable celebration in Ryston in the hometown of Newbridge on Friday 28th January. It was a great collaboration with the finest of promoters, marketers, stage builders, bog oak artists, lighting and ambience creators, slide show projectors......and a few songs. This was a special night on home turf. Then off to Holland for a most interesting, challenging and rewarding tour of Dutch theatres with Jan Douwe Kroeske. Jan Douwe has been playing my songs on his radio show(2 Meters) for 20 years. He has 1500 hours of archive footage from an wide range of performers, songwriters, bands. He created a theatre show based on his experience, and uses his footage to enhance his stories. I was his musical guest on the tour. We talked, laughed, and I sang songs. It was a great experience. Now I am home for a week of rest in early spring heaven, that is Ireland. Everything is changing. New life, new light, new colours, new textures. Of course the political landscapes are changing also, but nothing is so radical as the change of seasons. And it happens every year. Most of the time we don't notice, we are so wrapped up in politics, commerce.... All around us radical change is happening all the time. Change is the only constant in life; yet it always surprises us. So a week of rest, and then off for the great adventure that is my beloved Australia. And a visit to New Zealand for WOMAD in New Plymouth. This should be really special; my only regret being the lack of time to go and sing in Christchurch. I'd love to go and sing there now. But the people of Christchurch are in my thoughts and prayers these days. I won't pretend I understand, but I do care in a big way and I will sing for you in WOMAD. Floods, cyclones, fires, earthquake....It's time for a few songs down under!
. . . 2 0 1 2 . . . It is always sweet at year�s end to pause and rewind for a moment before embracing the new year and what a year this has been. So much change in our world, so much uncertainty now. Life always has been an adventure, but never more than now. There is much to write and sing about for a wee folk singer from Ireland. The songs have been flowing in, and at this year�s end I am looking forward to recording again in the New Year. In February my friend Jan Douwe Kroeske invited me to Holland to perform for a month with him. Jan Douwe is a champion of music on Dutch radio and TV. He has gathered many hours of sessions and interviews in his 2 Meters Sessions and he created a very unique theatre gig full of songs and history. We shared some weeks of songs and fun with a fantastic crew, performing in great Dutch theatres. Jan Douwe is a music lover, and an absolute gentleman. I have total respect for him and gratitude for this adventure. Thank you to my promoter Carlos, in Rotterdam, who makes all my shows happen in Holland. Then off we went to Australia, Paul Scully and I. Paul has been my sound engineer for many years and of course we love Australia. I feel blessed that every eighteen months to two years, I get to go and sing there. It is always special, and even more so now with so many Irish people coming to the gigs. Adrian Bohm has promoted every show I have ever done in Australia, and I hope this will always be the case. In 2011 we also made a long overdue return to New Zealand, for WOMAD in New Plymouth. Loved it � I�m mad to go back and sing more there. As always, the gigs were just so enjoyable, especially the two WOMAD festivals in Adelaide and New Plymouth, and Port Fairy AND Katoomba! And as always, the Enmore in Sydney had the magic about it. After the Enmore show, I met two mighty women, Lynn Bain and Aileen Barry. They belong to an organisation called Dalai Lama in Australia. They were bringing His Holiness to Australia in June and asked if I would like to join the tour and sing a song each night before His Holiness spoke.....? Eh, YES please! I've written about this before, but once again it needs to be acknowledged just how great this experience was. I will never forget it. A big THANK YOU to all the amazing people who worked on this tour. The highlight of this experience was the opportunity to meet so many Tibetan people. They had travelled great distances throughout Australia just to get a glimpse of their spiritual leader. Meeting these Tibetans also gave me a great reminder of the thousands of Irish people who fled oppression at home and found themselves in far off shores. Great sadness, but great dignity and kindness, and even fun! Tibetans are up for a laugh, and that gives the Irish an immediate connection with them. The Tibetan people are always in my thoughts. Between the two trips to Australia in 2011 there was the significant matter of my tour in Belgium in May. Belgium has the best singers, with people getting so involved with the songs. It reminds me how blessed I am to get to sing most days. Pascal Van de Velde in Gent is my man who makes these great gigs real. To him and his office a big thank you. After the Belgian tour I landed back in Dublin the same day as Queen Elizabeth. It was the first visit by a British monarch to Ireland in 100 years, and her first time in Ireland. This was not a visit I was interested in, but like many others, I was ambushed and charmed. Her stamina and her determination to connect moved many many people. Her silent bow in our Garden of Remembrance in the heart of Dublin inspired me to pen a song 'A Seed was Sown'. This song will feature on my new record in 2012. In September, there were two great shows in Cambridge and London, thank you Jane Skinner. This was followed by a really unique and beautiful tour in Switzerland. Switzerland has gradually become one of my favourite places to sing. The gigs are really interesting and different - from a rooftop terrace in Zurich, a garden centre (! ), some great theatres and clubs, and then a chance to explore Bern, and swim in the Aare. Again, how blessed is this life of songs. Thank you so much, Katharina and Martina, who book my shows in Switzerland and make everything brilliant! My last show was in Schaffhausen in Switzerland; an Irish night with Shirley Grimes, and was a lot of fun. My last professional 'outing' of 2011 actually occurred here at home when Tommie Gorman filmed me singing 'A Seed was Sown' for his RTE documentary 'The Queen's Speech', about the queen's Irish visit. Looking over the year, it is full of magic. There are so many memories. And in truth, though there were very few Irish gigs this year, my favourite gig of the year was in my home town, way back in January. Red Events in Newbridge County Kildare organised a night in Ryston. There was a unique atmosphere. People came from all over the place, my family were out in force and we all sang together. I never enjoyed a gig in Newbridge so much. The sound was special, the staging was impressive, and included beautiful bog oak sculptures by Brian O'Loughlin from Rathangan - a legend. Throughout the year, each one of these gigs involved so much work by so many people. That is the magic of the gig. Not just the singer onstage, but all the unseen work done by promoters, agents, crew and every night a new team. It is a beautiful life. And I take this moment to simply say thank you to all the people who make every show happen. I also say a huge thank you to each person who chooses to invest an evening of your life to be there with us to hear the songs. And in the final hours of 2011 I am preparing new songs to offer next year. The coming months will be important. I know people are having tough times. I know the singer has a job to do, and I really want to honour the songs, and head back into the world to sing and sing again. Hearing songs has always lifted me up through my life, and now I am keen to sing for others, especially here at home in Ireland. I hope these troubled times bring out the best in us all, and we come together more around the songs, the poems, the stories, the dance - all the good things that nourish our lives. In a rush to get this little message out before the year ends, my favourite read this year was David Byrne's Bicycle Diaries, the best gig I attended was the Waterboys Yeats gig in February in the Abbey Theatre in Dublin, and my favourite movie was The Guard, because it made me laugh and Brendan Gleeson is a legend. God bless, and thank you all who made 2011 so full of goodness.